Babies need a lot of interaction, so there’s always lots of hugging, singing, rocking, reading, and playing are standard fare in every infant room. Children respond best to warm, face-to-face interactions, so our teachers always interact at their level. 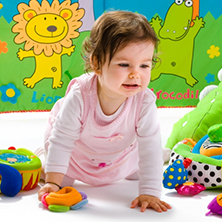 We provide a safe, warm, and stimulating environment for your child’s development in our infant daycare center! We have specific places for sleeping, playing, diapering, and feeding, which provides a sense of order and security in a cheerful atmosphere. Children’s Ark Academy’s curriculum is written to allow teachers and caregivers to provide attention and individual care to your infant which is a daycare with activities that educate and stimulate your infant. Our age-appropriate curriculum includes sign language which provides preverbal children with an option for communicating. 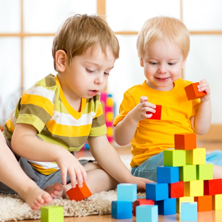 The programs below allow for the proper stimulation to make those brain connections that occur so rapidly developing the cognitive , physical, social, emotional, and spiritual needs of each infant. Daily activities consist of providing a flexible schedule for caring, nutrition, rest, and stimulating your child so they discover the world around them using all five senses, copying simple actions of the teachers around them, experimenting with infant toys, exploring textures, colors, and learning a variety of words and sounds through singing and playing. The Nursery and Crawler rooms have an electronic Air Purifier that runs 24 hours a day. This HEPA filtration system removes the dust, pollen, viruses, bacteria, odors, and other particles that float through the air. 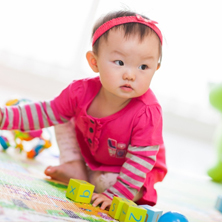 Want to know more about our infant daycare programs? Contact Children’s Ark Academy today!